Want to make your favorite winter activity even more fun? 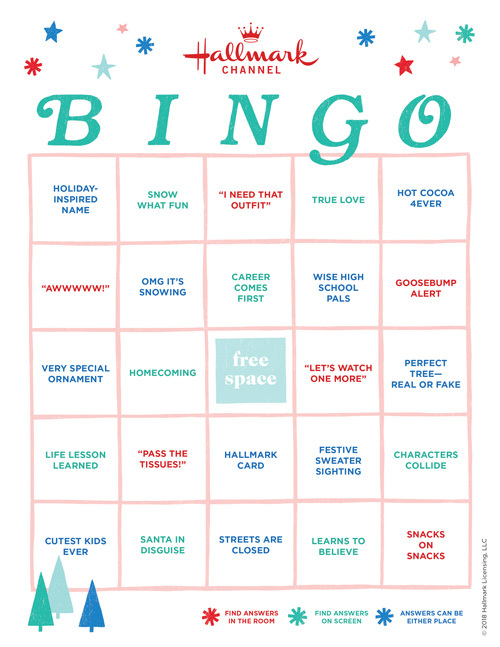 Add Hallmark Channel Christmas movie bingo to your holiday binge-watching. Keep an eye out for perfect trees, special ornaments, and steaming mugs of cocoa—and if they happen in just the right order, you win! Inspired? Create and share by tagging @think.make.share and @HallmarkStores. 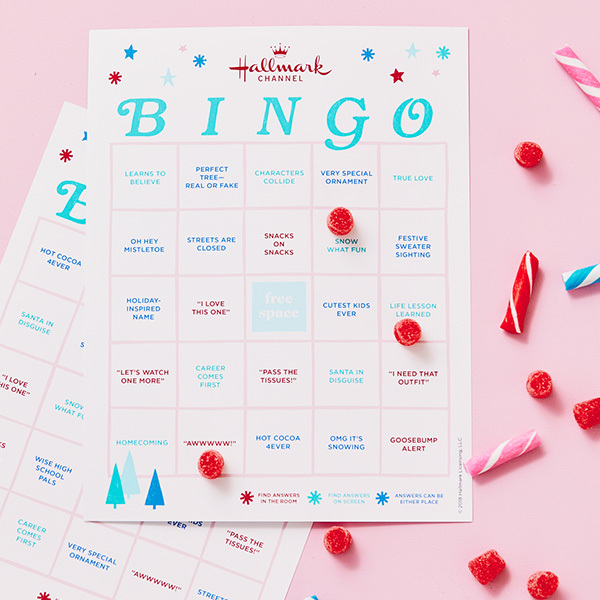 Printed Hallmark Channel Bingo cards – Download them here or click the image of the board below. Got your card and some markers? Great! Heads up! Look for answers in three places: In your living room with the “characters” at your watch party (red words), in any Countdown to Christmas movie (green words), or in real life or on screen (blue words). Choose a pattern for the win: instead of five squares in a row, try blocks, arrows, or a seasonally appropriate bell shape. Trade cards every time you start a new movie. Sip a tasty beverage every time you fill a square. Yell something silly besides “BINGO!” May we suggest singing “Jingle Bells” or shouting “I believe in Christmas!”? If someone wins during a serious/romantic/emotionally climactic moment, they have to wait until it’s over to yell anything. Winner must read off filled squares before claiming victory. Opponents may make challenges (“That sweater is not festive enough!” “Those aren’t real tears—allergies don’t count!”) by saying, “Humbug!” and making their case. We love Hallmark Channel holiday movies as much as you do. Along with Christmas movie Bingo, check out watch party ideas on Think.Make.Share, including drink and popcorn recipes and a holiday sweatshirt DIY. And, of course, we’ve got plenty of hot cocoa and holiday punch recipes!